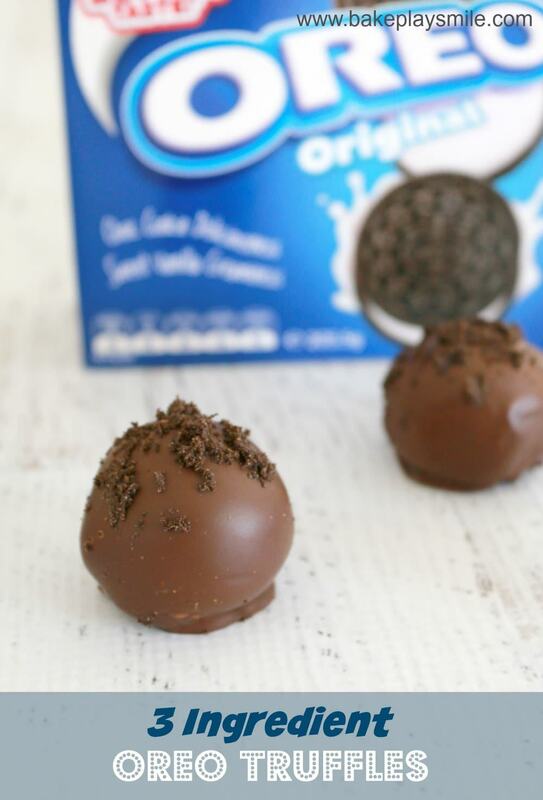 Rich and oh-so-creamy Oreo truffles made with Oreo cookies and cream cheese then covered in chocolate… does it get any better than that!? Made with only 3 ingredients and completely no-bake… these really are just the easiest little treats! I’m sure you all know by now that I am a total and utter chocoholic. Whoever invented chocolate should really be awarded a medal. In fact, the only thing that comes close to my love of chocolate would be cheesecake… or anything that involves salted caramel… or in fact a slice of really good cake is pretty awesome too. Hmmm anyway! 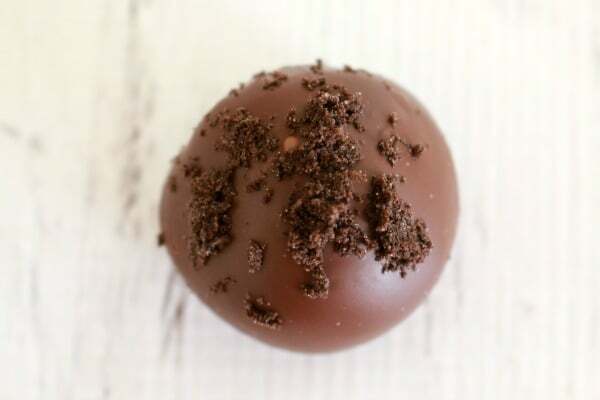 Oreo Truffles are the best little things because they incorporate three super awesome, totally amazing, ridiculously delicious ingredients – chocolate, cream cheese and Oreos. Seriously that’s it! 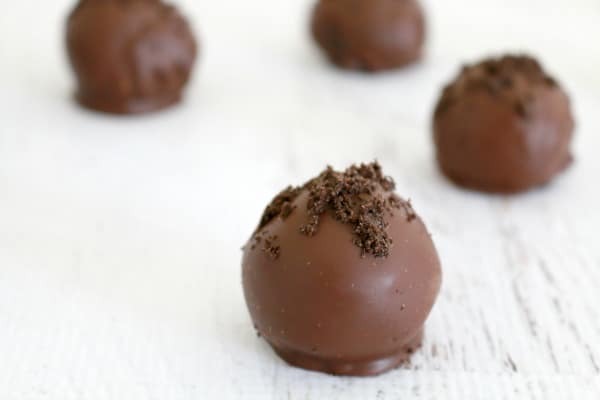 You only need three ingredients to make these truffles and every single bite will take you one step closer to heaven (not really, but we can all dream, right!?). 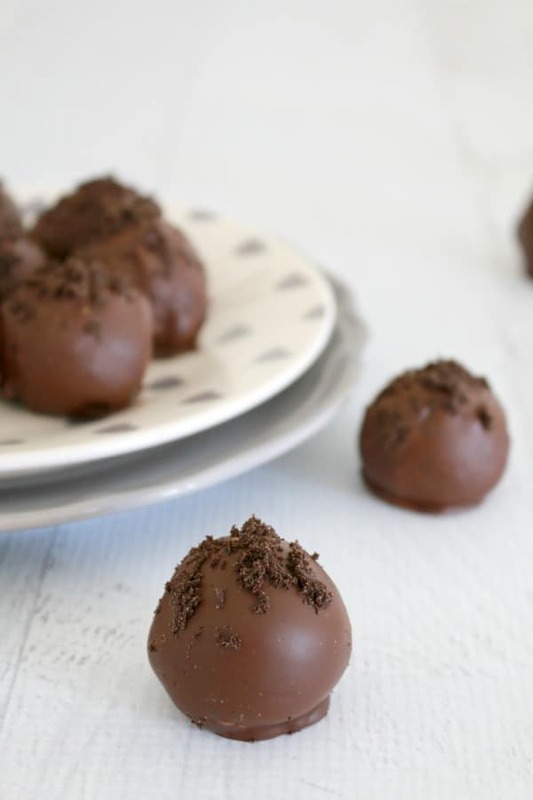 To make the Oreo Truffles simply crush the biscuits in a food processor or Thermomix. Add the cream cheese and mix until well combined. Roll into balls and place onto a baking paper lined tray. Cover in melted chocolate and sprinkle with extra Oreo crumbs (or cute sprinkles, crushed candy canes, sugar balls etc). Place into the fridge to set. 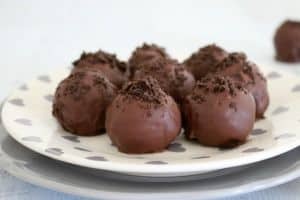 These Oreo Truffles would be the most amazing little treat to give away as a Christmas gift, or for a yummy party food treat. But really, they’re just the best thing ever for a cheeky little late night snack! See below for the super-duper easy conventional and Thermomix instructions. This is one of the deliciously decadent recipes featured in our our Christmas Homemade Gifts eBook. It’s packed full of everything from sauces and condiments, to cookies and biscuits, slices and bars, and of course, all your classic favourites (including these Oreo Truffles!) – so there really is something to suit everyone! Click here to buy your copy for $7.99 (or if you subscribe to Bake Play Smile you can purchase it for only $3.99! 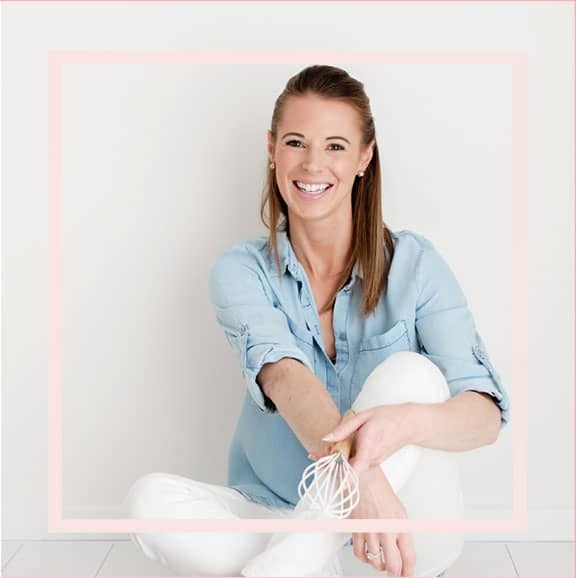 And I promise I won’t email you any junk… just really yummy recipes!!). 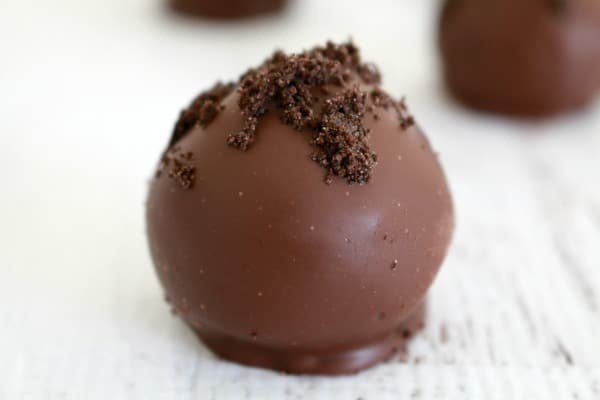 Rich and oh-so-creamy truffles made with Oreos and cream cheese then covered in chocolate... does it get any better than that!? Crush Oreos until they resemble fine crumbs (set aside 2 tbs of crumbs to sprinkle on top). Mix Oreo crumbs with the cream cheese. Roll into 1 inch sized balls and place on a tray lined with baking paper. Place chocolate in microwaveable bowl and microwave on 50% power for 2-3 minutes, stirring every 30 seconds, until chocolate is completely melted. Place the truffles into the bowl of melted chocolate (in batches) and use two forks to roll the truffles around until they are completely coated. 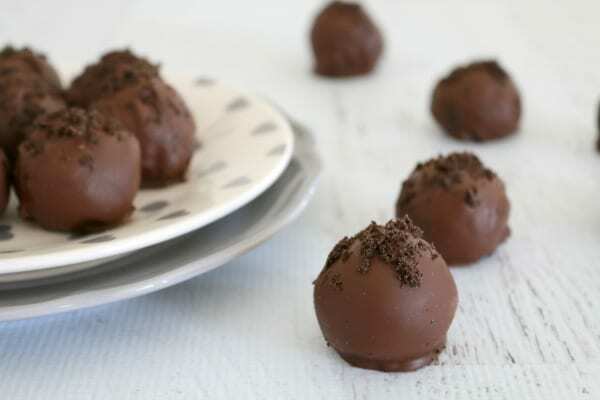 Remove truffles with the forks and allow any excess chocolate to drip off. Place back onto the baking paper lined tray and decorate with your choice of toppings (ie. crushed Oreos, candy canes, sprinkles, baubles etc). 1. Place Oreos into the TM bowl and crush on Turbo until they resemble fine crumbs (set aside 2 tbs of crumbs to sprinkle on top). 2. Add the cream cheese and mix on Reverse Speed 2 until well combined (scraping down the sides of the bowl occasionally). 3. Roll into 1 inch sized balls and place on a tray lined with baking paper. 4. Place chocolate into a clean TM bowl and melt on 50 degrees, Speed 3, 2-3 minutes, scraping the sides occasionally. 5. Pour the melted chocolate into a bowl. 6. Place the truffles into the bowl of melted chocolate (in batches) and use two forks to roll the truffles around until they are completely coated. 7. Remove truffles with the forks and allow any excess chocolate to drip off. 8. Place back onto the baking paper lined tray and decorate with your choice of toppings (ie. crushed Oreos, candy canes, sprinkles, baubles etc). 9. Place into the fridge to set for 1 hour. These look so decadent – I can’t believe there are only three ingredients! Oh my, if I keep making all these delicious recipes you post you will need to roll me out of the house this Christmas! I am also a chocoholic! And we must be weirdly in sync considering I just made these this weekend too! 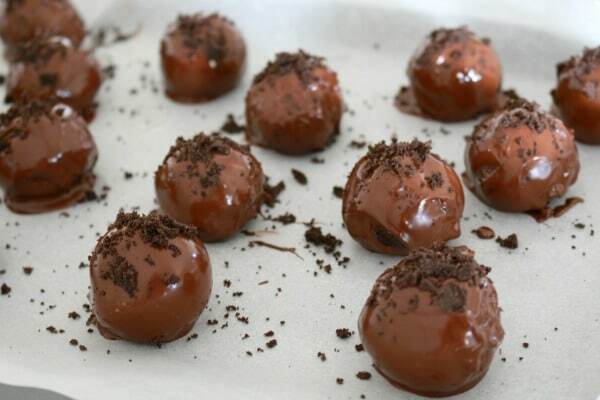 Oreo truffles all the way! Haha how strange was that! Great minds think alike! These look incredible. How do you get your chocolate to look so smooth- did you pour over or dip? I’ve made Tim Tams like this but not Oreo ones.